It seems there is a bit of a convergence going on and I figured what the heck why not jump in and be part of things. It all started in December when Maha and I published an article in the International Journal of Educational Technology in Higher Education titled “A call for promoting ownership, equity, and agency in faculty development via connected learning” where we made a case for faculty development opportunities that embraced connected learning as a means toward well… ownership, equity, and agency. We highlighted several examples of this happening already including Virtually Connecting, #DigPINS, Marginal Syllabus, Untethered FacDev, and others. 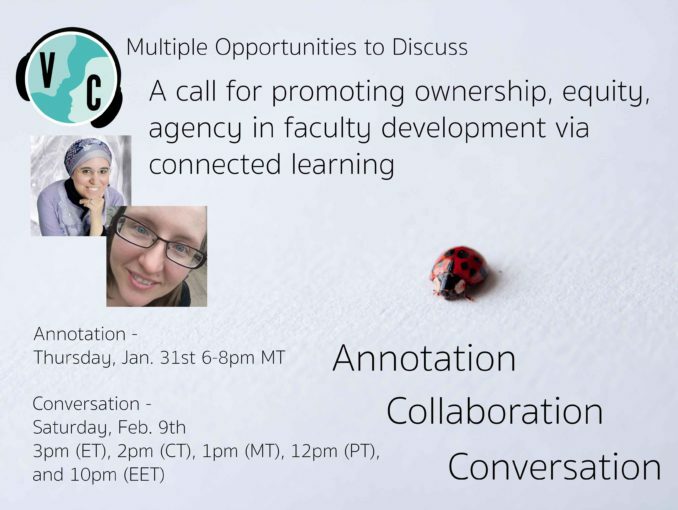 The article got some good attention and then Taylor Kendal and some folks of the Pedago.me community organized an annotation jam for this Thursday, January 31st from 6-8pm MT. I’m trying to get some of those who are annotating as well as some of the leaders of the projects we mentioned in the article to join the call. If you have read the article and would like to discuss it feel free to let me know and I’ll be sure to get you a join link. The best way to reach me is Twitter but I will also try to keep an eye on the comments here (tho I’m moving and have about 1000 balls in the air right now so if you could use Twitter that would be great). Also, disclaimer: If we go over 10 people then I do have access to a Zoom account. However, it does not allow for live streaming so I will post the recording here afterward. Finally, I just want to point out that this paper is only the latest in what has really become quite the collection of published articles, scholarly blog posts, and presentations from a whole host of people who are either directly writing about Virtually Connecting or highlighting VConnecting as an example of something larger. You can check it all out on our Virtually Connecting Scholarship Page. Can’t thank you and Maha (and the VC community) enough for your tireless work and openness to connected and connecting learning.